Did T-Mobile Really Kill the 2-year Mobile Phone Contract? T-Mobile is touting no-contract plans called "Simple Choice" that allow smartphone customers to pay monthly and drop their plans at any time. You get unlimited voice, text, and data service for one monthly base fee, and can choose a 4G data "bucket" option that suits your needs. The Simple Choice plan comes with unlimited talk, text, and web, and costs $50 for the first line. Adding a second line costs $30, and additional lines cost $10 each. And there is no two-year contract or early termination fee if you switch carriers. So far, so good. The catch is that data bits are unlimited but speed is not. Unless you pay extra, only your first 500 megabytes of data will be at 4G speeds. You can pay an extra $10/month and bump your 4G allowance up to 2 gigabytes/month. If you exceed your 4G allowance, you won't pay overage fees, but the rest of your data usage for the month will be at 2G speeds. That means S-L-O-W. If you use more than 2 gigs of data, and don't want to be throttled, you can get unlimited 4G on any of your mobile devices for $20/month. The unlimited 4G option also gives you 500 megabytes of Mobile HotSpot data. Here's a pricing example for a family of four. Your starting price will be $100 (50 + 30 + 10 + 10). If any family member wants more than 500 megabytes of high-speed data per month, add either $10 or $20 per line, depending on how much data you burn. For my family, we'd get by on $130/month, which is about $50 less than I'm paying for Verizon service. And the mobile hotspot, for which Verizon charges $30/month, would be free. Too bad I can't get a T-Mobile signal at my home. What Exactly Does "No Contract" Mean? Yes, with T-Mobile's new Simple Choice plans, you can switch carriers without paying an early-termination fee. But you’ll pay full list price for a smartphone, which can be several hundred dollars up-front. 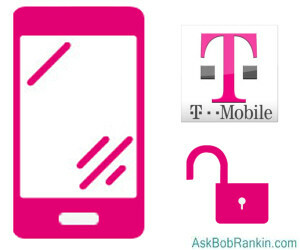 T-Mobile is lowering this barrier by offering a phone financing option. You make a small down payment for the phone, then pay the balance off in monthly payments for –- wait for it -– two years. After the phone is paid off, you own it. Well until it’s paid off, guess what? You have a contract to pay for the phone! If you bail out before 24 months, the remaining balance is due. Essentially, T-Mobile is just switching the contract obligation and early-termination barrier from its service to the phones it sells. And until the phone is paid off, it remains locked in to T-Mobile service; it’s useless with any other carrier. Just download some free software that unlocks the phone, you say? That was legal for a while. But in January, the U.S. Copyright Office eliminated your right to unlock a phone without your carrier’s permission. If you do, T-Mobile has you for circumventing its software security as well as the remaining balance due on the phone. You’re not just a deadbeat debtor; you’re a criminal. I don't mean to say that T-Mobile's new Simple Choice deal is all bad. The advantage of this "contractless" deal is that after the phone is paid off, your monthly bill decreases. Other carriers keep collecting the hardware fee built into their monthly service charges for as long as you’re a customer. So the new T-Mobile "contractless" scheme is good for long-term customers. Depending on how many mobile phones your family uses, and how large your data appetites, T-Mobile's Simple Choice plan could save you money over Verizon or AT&T. And because T-Mobile allows customers to bring their own GSM-compatible device, it could be a win for some. On the downside, T-Mobile’s "contractless" plans have no "family friendly" shared data buckets. Each line added to your account gets unlimited voice, text, and data service, and lines can have different 4G data bucket sizes. But your spouse or Junior can’t use any of your surplus 4G allowance. Or vice versa. And in case you don’t have enough decisions to make, T-Mobile continues to offer traditional two-year service contracts. For some, navigating complex smartphone pricing schemes is "freedom of choice." For others, it’s a stressful and confusing maze of choices and uncertainty. Most recent comments on "Is The Two-Year Mobile Contract Dead?" Being a tourist who sometimes travels to the U.S., this is great! Now I can get away with pay-as-you-go for a month or two, rather than having to rely on half-good wifi in malls and hotels, or worse still roaming, which costs an arm and a leg. Thanks T-Mobile! If your spouse or junior comes close to the 4G allowance, it seems simple to let them use your excess by trading phones for an hour or so every few days. Anyone who needs the 4G download NOW is a download addict who needs to get out into the park and be untethered for a while. Bob - No. The two yr contract is not only NOT dead it is probably going to be rejuvenated even more now that pressure is being brought to bear by politicos on land line companies to reduce government subsidizing. As for providing relief for early termination due to family emergencies, forget it. I know since I went through the process after my wife died. I am now using Consumer Cellular and they are a delight to do business with - no contract; provide sim cards for free so you don't have to buy a new phone, etc. I have bundled my computer service with Century Link and retain a land line. It saves money overall and gives me the freedom to focus all long distance calls at little or no cost. Since I only use my phones for making phone calls I don't need any of the fancy whiz bang stuff(cellular or otherwise). Sounds good but what about phone network coverage? Is it as good as Verison? Hmm. By the time you're through paying for the smart phones, I'm not sure I'd come out ahead at all with T-Mobile versus Verizon. Now if the vendors would just make phones that lasted longer. At least T-Mobile are straight with their deals. Here in Canada I contracted with FIDO for 3 years because the company offer "Canada wide coverage". Only after I moved to Northern Canada for a few month did I find out there was either no or very little coverage there. Fido freely admit and offered me a discount. A discount for what? Even for less money I could get any better reception. When I wanted to terminate my contract because of non-fulfillment, Fido informed me that I still had to pay the cancellation fee because the contract was signed in Vancouver where there isadequate coverage. It was my fault not to tell them that I was planning to move to Northern Canada half way throught the contract. Here I had thought I had purchased a "mobile" phone service. Excellent summary of the new programs from T-Mobile. I was on this like a duck on a June bug! My monthly plan dropped to $50 (+fees). It had been $79.00. I will buy a new HTC One as soon as I can and probably pay the full price up front and put that extra $20 into my 0.1% money market account. I will not. Definitely. My favorite principle is "call and forget" - not a single cell phone (I have three) is linked to my name; they all are "grey"; only pre-paid schemes allowing for anonymous usage have been used (in my case) since the 1990's. Bob, thanks for the excellent job, BTW. Been your faithful reader since, I believe, 1996 when the _squirrels_ were your trademark. For a few people the T-Mobile contractless plans will be a good deal, but not for most. Most people don't keep their smart phones more than 2 years. If you do change every 2 years than T-Mobiles plans are going to cost about the same as everyones plans. If you want to buy a smart phone outright (including iPhones) and keep it more than 2 years, I highly recommend the $35 Virgin Mobile contractless plan. And, btw, Tmo is also getting the iphone 5 in this new deal - with all working functions unlike the unlocked other iPhones. I'm paying about $180 a month now for three iPhone 4S phones with AT&T for about the same coverage I could get with T-Mobile for $100 a month. We all love the iPhone 4S and have no desire to change phones. And I live in the mountains but the T-Mobile coverage map shows I can get coverage at my ranch. When my two year AT&T contract is completed in 4 months, I'm going to T-Mobile with our iPhone 4S phones. Will be nice to save $80 a month. Consumer Cellular has better coverage nationwide than Verizon. I have been using it for a number of years. Additional phone line is $10 per month and I can choose how much or little to pay for each month. I have yet to use the data serrvice since I am tied to a Verizon USB contract for a few more months because of work. Guess what happens when that 2 years is up!!! Consumer celluar also has inexpensive phones that work very well. ONE HAPPY CUSTOMER WITH A COMPANY THAT DOES WHAT IT SAYS. EDITOR'S NOTE: Consumer Cellular operates on the AT&T network. There may be some area served by AT&T that Verizon doesn't cover, but overall, Verizon has coverage in more areas of the U.S.
As to coverage I have had zero problems with Consumer Cellular. Check out their message. Regardless of the "Big Company's" marketing ploys....I'm quite happy and satisfied with prepaid TracFone. BUT...I don't have a cell-phone growing out of my ear, either ! I can access the Internet IF I desire to do so....on one of my TracFone cell-phones....but I don't (except for "practice"). I have it just incase the Desktop Computer "goes-down" and I need to do some "Internet Banking". SIMPLE for me....AND MANAGEABLE !!! I usually use my old cell-phone for my few phone-calls --NO land-line---. The old cell-phone (an LG 200 ? ) is EASY to use and doesn't even have a camera! I don't NEED the camera....but the LG500G with QWERTY has a camera....that I don't use. WHY "fool-with" these "Contract/No Contract things? I get by just fine spending about $ 15.00/month (average) on Pre-Paid TracFone....which has NEVER given me ANY connection problems !!! t-mobile offering changes may be the reason why our signal is now seemingly being further diluted inside buildings as of late; maybe trying to create space for an expected onslaught of people switching to them & also being able to say they can offer enought 4g bandwith through their existing infrastructure. I was a loyal T*Mobile customer for 13 years, but just recently switched to Verizon. Yes, I am paying a LOT more money, but I haven't dropped a call since. Unfortunately, T*Mobile's coverage seemed to decline over the years, to the point where I couldn't get a signal in places that used to be fine (I had a Samsung Galaxy S). Including in my home. However, T*Mobile excells in urban areas. If you don't stray too far from metropolitan terrain, I say, check them out. Customer Service is very good, too. I am a current tmo customer and just checked their website--no mention that I could find of any plan except the new Simple Choice. The plan that allows you to bring another carrier's phone costs more than the one that allows you to buy a phone from tmo ($20/month), perhaps because tmo gives you a sim card to make the phone conversion? Last fall I changed my tmo contract to one with no phone included, and it was $10-20/month cheaper. I inquired about a lower rate since I didn't need a new phone and they handed me a brochure with the lower rate for exactly the same services, sans phone. Made me happy. Whatever they are charging it is still too much. I have been in UK and dreading returning to the North American overcharging and inflexible "service". You can buy a basic pay as you go mobile for as little as £6 (around $10. I bought a smart phone (including GPS) for about $150 and get 100mb of data for $16 per month. I get extras like "magic numbers" that I can call for around 40c per hour, and free texts (400). There is a sim deal where you can get 500mb data 1000 texts and 1000 calls. And you can easily switch company by switching a sim. Bob ... Not really sure, that the 2 year contracts for Mobile Services is "dead" or will be, anytime soon. The Mobile Companies LOVE the whole concept of, contracting the world. They like making money, anyway they can. While, I don't like the contracts any more than others, I know that I have better service with my Mobile Service, than I did with a Pre-Paid Service. What I like best about a Contract Mobile Service, I know basically what my monthly bill will be and I am covered by warranties and Road-Side Assistance. I have had to use the Road-Side Assistance and it was easy, plus NO money was exchanged, LOVED that alone.